As per the research conducted by Transparency Market Research, the diabetes devices market has been noted to have a consolidated vendor landscape globally. F. Hoffmann-La Roche Ltd. Medtronic plc, Sanofi S.A., Eli Lilly and Company, and Novo Nordisk A/S, are a few of the main players in the diabetes devices market globally and the main reason behind their upper hand on this market is the variety they offer in their products. Most of these players are now focusing on entering in the developing markets and make use of the growth prospects available there because of economic development. However, manufacturing of basic and cheaply priced diabetes devices will be their main plan. One of the main plans and areas of focus for the manufacturers will be expanding geographically by merging with the other players, as well as partnerships for their benefits. 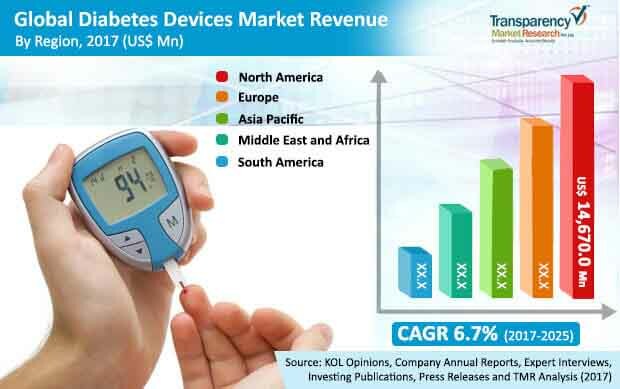 As per the reports of Transparency Market Research, the diabetes devices market is predicted to account for a total of US$66,053.1 mn by 2025, whereas in the year 2016 it was accounted for a total of US$37220.8 mn globally thereby growing at a CAGR of 6.7%. Although there are many items that help in managing diabetes, glucose monitoring devices and the different items that fall under it are predicted to lead the diabetes devices market globally. In terms of the income generated, the glucose meters segment accounted for a total of 59.1% of the total income generated in the year 2016 globally. On the basis of geography, North America is the dominating market because of the existence of advanced as well as up to date healthcare systems. Primarily, the demand for global diabetes devices market is carried forward by the growth in the number of patients diagnosed with diabetes throughout the globe. A few major reasons behind the growth in the occurrence of diabetes among patients is the stress people take, consuming alcohol in large quantities, unhealthy food consumption, as well as because of lifestyle that does not consist of much physical activities. In the last few years, the growth in the number of patients suffering from diabetes has boosted the requirement for diabetes devices. Due to the existence of devices like testing strips, continuous monitoring devices, lancets, self-monitoring blood glucose metres, that are cost effective as well, have a healthy impact on the market in general. Plus, the growth and awareness regarding managing diabetes is expected to bolster the diabetes devices market. Because of the entrants of new products in the market, the diabetes devices market is said to have been further boosted. Like for example, the new novel insulin delivery device is predicted to increase the requirements for diabetes devices for home disease management. Improvement in home monitoring devices are also anticipated to boost the demand for usage at homes. Along with this, the designing as well as the ease of using the devices, is considered to be an important factor too that is boosting the demand of diabetes devices for use at home. The players of this market are making devices that are very safe as well as productive, which in turn is causing the demands of the diabetes devices to rise.